Cabbagehead Press: "Risseeuw's art has often touched on political and social themes, including political corruption, equal rights, environmental abuse, fascism, illegal wars, arms proliferation, and sheer idiocy." Tempe, Arizona: Cabbagehead Press, 2011. 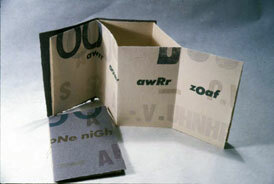 Edition of 30. 7.5 x 9.25" closed; 7.5 x 140" extended. 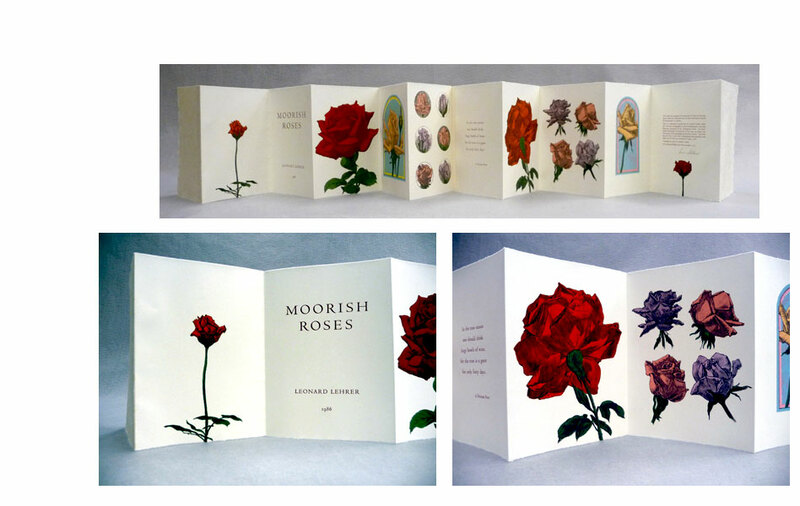 Accordion book with leatherbound covers. Letterpress and relief on shaped, variable paper handmade from the clothing of landmine victims, minefield plant fibers, and currency of mine-producing nations. Printed two sides in ten sections. Paper title label on front cover. Signed and numbered by the artist. John Risseeuw: "The subject is landmines and landmine victims. From 2001-2007, The Paper Landmine Print Project involved making paper and printing landmine images, facts, and stories of victims on it. In hand papermaking, we make paper from cotton, linen, or silk clothing - rags - as well as plant fibers and other sources of cellulose. I collected articles of clothing from landmine victims (this means only a representative piece of clothing - something the person wore - not from the accident itself), fibrous plants from mine locations, and shredded paper currencies of nations that use or make landmines. "I visited Cambodia, Bosnia-Herezgovina, and Mozambique to gather background information, interview victims, obtain donations of clothing from some, speak with deminers, and take photographs. Through contacts, clothing and information sent from Northern Iraq, Nicaragua, and Angola were obtained. In addition to fifteen relief prints on handmade paper, a series of dimensional paper pulp castings were made and now this book on paper made from clothing, fibers, and papers left over from the prints. 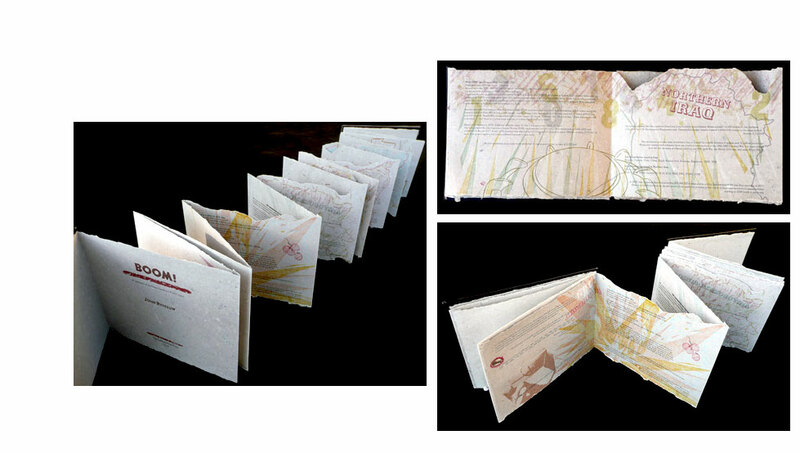 "This artist's book, hand printed on shaped, variable, handmade paper, summarizes and updates the prints with data from the Landmine Monitor and other sources. The twin purposes have been always public education to the problems fundraising for the organizations that assist the victims. Proceeds from the sale of this work have been and will continue to be donated to the Landmine Survivors Network Cambodian Handicraft Association for Landmine and Polio Disable, Vietnam Veterans of America Foundation, Mines Advisory Group, Adopt-A-Minefield, and Handicap International. To date, over $22,000 has been raised." [Tempe, Arizona]: Cabbagehead Press, 1986. Edition of 52. 7 x 5", 12 pages. Accordion fold. Lithographic drawings by Lehrer. 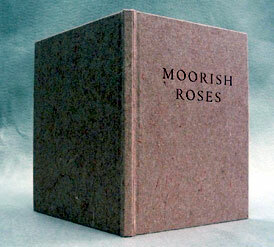 Laid in handmade paper-bound case. Numbered and signed by the artist on the colophon. Colophon: "This book was prompted by memories of visits to Granada, Spain, where the Alhambra and its roses continue to remind us that paradise is a garden. " Leonard Lehrer, artist statement www.leonardlehrer.com: "Among the forces directly impacting my work are the paintings of Pontormo, the gardens and domed ceilings of the Alhambra, the movie 'Last Year at Marienbad' and the writings of Jorges Luis Borges; the simultaneity of experience, i.e., that past, present and future all exist at the same moment - at this very moment - is at the very core of my understanding. Through my images I try to comprehend the very nature of my experience. I attempt to address the magic of the arts, the unexpected, the sense of discovery that the adventure of my life has provided for me. From the wonderment of the paradise garden to efforts in addressing great loss, I find that the arts embrace everything." Tempe, Arizona: Cabbagehead Press, 1997. Edition of 40. 4 x 5.7" closed, one sheet book. Letterpress from wood type and large sans serif letters, mostly caps, in varying point sizes. Double-sided accordion. Pamphlet stitched in grey printed covers. Can be drawn out flat to create two long, landscape pages. Signed by the artist. Pure typographic storytelling. 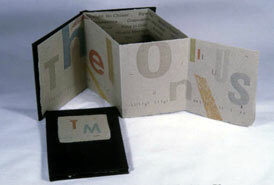 Collaged and overprinted words and letters function as both text and illustration. This explosion of sound-words - large OOOs, guttural expressions (awrr), and ambient noises (szs) - suggests setting and story, as the title fragment suggests that familiar and foreboding first line, "It happened one..." Imagination draws up things that go bump and shuffling sounds and creatures outside; or, perhaps nothing of the kind is meant. Open to broad interpretation. 3.5 x 4.75”. Letterpress from typographic ornaments, sorts and wood type on grey paper handmade by Risseeuw for the edition. 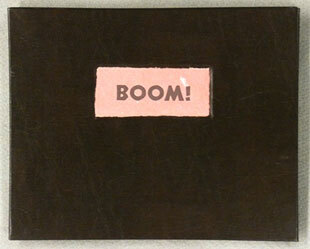 A single sheet, folded Origami-style, is sewn into black cloth over boards with a handmade paper label. No, not a book on meditation, but a visual meditation on jazz great Thelonius Monk. Risseeuw crafts texture, color, and impression into a visual celebration and translation of the jazz sound. Monk fans will recognize titles and subtle visual and rhythmic references. The book elements work together to create a visual feeling for Monk's music. Quiet yet vibrant ink colors. Deep impression adds to the visual texture of the page.